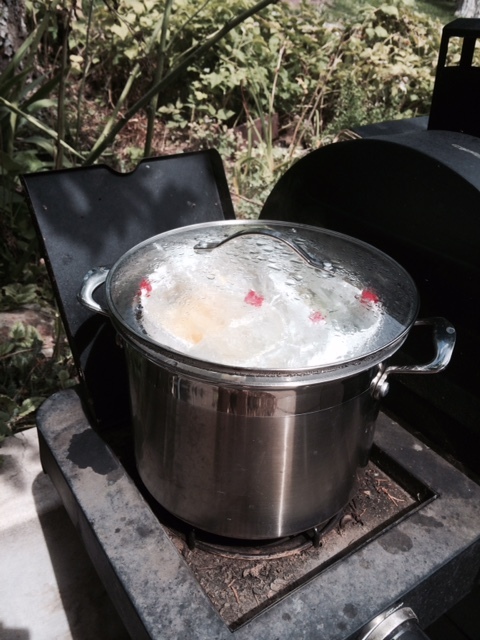 Dyeing happens in my backyard, using the side burner of the BBQ. I use acid dyes and about 8ozs of scoured wool at a time. Sometimes I dye commercially prepared undyed skeins. I learned to use acid dyes in a workshop with Cornelia Theimer Gardella, that was offered at the Recycled Lamb. Dottie is one of the fleeces I source from Ramstead Ranch. They have a fabulous flock with a good range of colors and different breeds from which to choose. Romney is one of their main breeds and Dottie is variegated grey. The dyeing made for rich, ‘heathered’ fleece that spun up beautifully.